In this Christian DVD, these characters are situated in season 3 and they have grown since we first met them in season 1. Not only have these beloved characters grown but the town of Hope Valley as well. If you haven’t seen this Hallmark Channel series I recommend it 100%. Great quality television that is hand and hand with wonderful values and morals that seem to be missing in everyday TV. 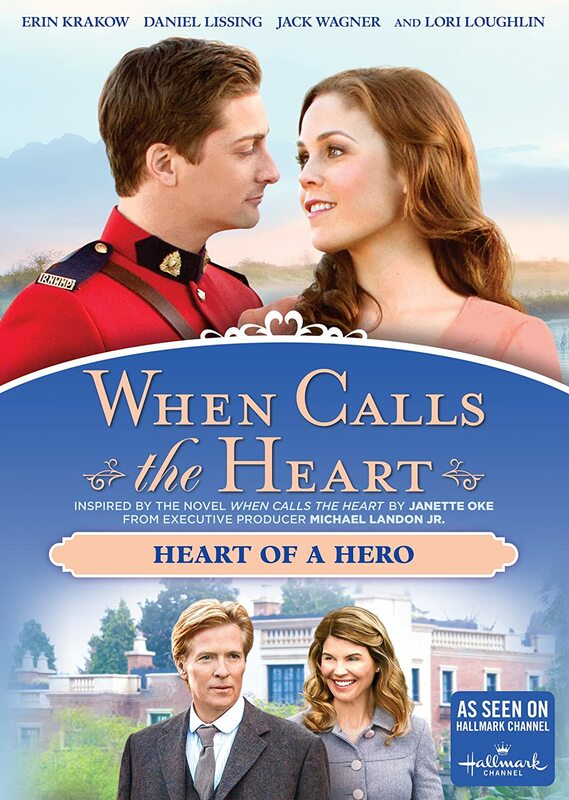 When Calls the Heart is inspired by the book series of the same name written by best-selling author Janette Oke. The Christian DVD When Calls the Heart: Heart of a Hero focuses on how new people are arriving to this small progressive town which has brought many great things but also danger. The Garrison gang arrive and Frank Hogan’s past with them is making things quite difficult. Lee suffers an injury and Faith Carter arrives from Hamilton to tend to him. Also, Jack defends new settlers in mayor Gowen’s land when he decides to raise their rent out of the blue. In this Christian DVD, we continue right after the huge revelation regarding Pastor Frank Hogan. It turns out that the whole town came to know that Frank was involved in criminal activity before arriving in Hope Valley. Of course, this comes as a shock to the whole town as they had full trust in the man offering God’s Word on Sundays. They really didn’t know how to react to this revelation, should he be removed as the town’s pastor or believe that he truly has changed. The town came to a vote and chose to give Frank the opportunity of continuing being their pastor. With this, Abigail has high hopes of getting to know Frank, even more, learning about who he truly is. Elizabeth Thatcher from When Calls the Heart: Heart of a Hero continues her job as a teacher but now she has been spending some time writing and focusing on her book all about her adventures living in the frontier. At school, Elizabeth’s students are getting ready to participate in Miss Thatcher’s spelling competition and all of them are very excited to be a part of it. All of them are planning to have their parents help them study. Cody is looking forward to having Abigail help him but Anna, one of his classmates, lets him know that it’s not the same since Abigail isn’t his real mother. Which of course makes Cody a bit frustrated and sad. Later on, we see that the Garrison gang, the ones who tried to taint Frank Hogan’s reputation and get the people of Hope Valley against him. Well, they are frustrated that their plan didn’t exactly work out so now they have to work on a new plan so they can steal some money from the town’s bank. What is going on with Lee and Rosemary? Well, Lee has suffered an injury in his foot. Basically, while he was at the mill, a cable broke and hit his foot and production came to a halt. Jack helps him and tends to his wounds as best as he can but the wound is actually worse than expected so they call in a doctor from Union City. Turns out the doctor was held back so who appears in Hope Valley now in When Calls the Heart: Heart of a Hero? Nurse Faith Carter. We met nurse Faith back in Season 2 as she was Jack’s brother Tom’s assigned nurse. Seeing Faith in town was definitely a huge surprise to Jack and for Elizabeth too. Now Rosemary is extremely worried for Lee and thinks she is quite capable of taking care of Lee, a bit too much. Abigail and Frank are getting quite close and in this Christian DVD, Abigail prepares to have a special evening with him. Even though Abigail has forgiveness in her heart for him for not telling her about his past originally, it still is sort of a concern for her. Worry creeps into Abigail’s mind as she wonders if Frank has truly moved on from his old ways and what it could mean for their future as she is opening her heart to him. To see how these storylines continue, make sure to purchase the Christian movie When Calls the Heart: Heart of a Hero at www.fishflix.com!